This class can be used to generate pages to create, read, update and delete table records. It takes a database table and a list of table fields and can generate forms to insert, update and delete the table records, as well list the information stored in those table records. 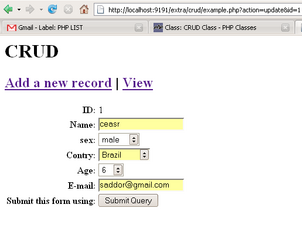 The class supports retrieving information for storing in the table record fields from joined tables. It does not require that the developer write SQL manually. It can support multiple databases using separate database abstraction layer classes. Cesar D. Rodas is available for providing paid consulting. Contact Cesar D. Rodas . Simple to make it work!! !